at Theatre on the Run 9am-3pm with extended day available for additional cost. 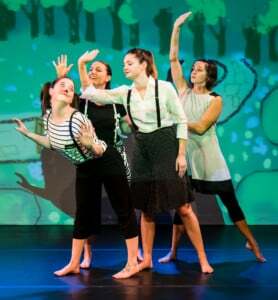 Join Jane Franklin Dance in a day camp for ages 6 – 10. Build physical skill and challenge creativity while exploring movement, theatre technique, and visual art. The day long exploration includes dance technique and creative movement, a fun visual art project, performance practice, and weather permitting, a trip outdoors to a nearby park. Wear loose fitting clothing, and bring snacks, lunch, and a water bottle for a day of activity. Our camp packet is a helpful guide with class descriptions, emergency contact form and waiver.